British finance minister Philip Hammond will use his annual budget speech on Monday to urge his divided Conservative Party to get behind the government's push for a Brexit deal, or put at risk a long-awaited easing of austerity. Hammond, who routinely angers many Conservative lawmakers by calling for close ties with the European Union after Brexit, will offer a glimpse of higher spending after nearly a decade of cuts to many public services. But he will also say that an easing of the spending squeeze will hinge on London reaching an agreement with Brussels to smooth Britain's exit from the EU in five months' time. 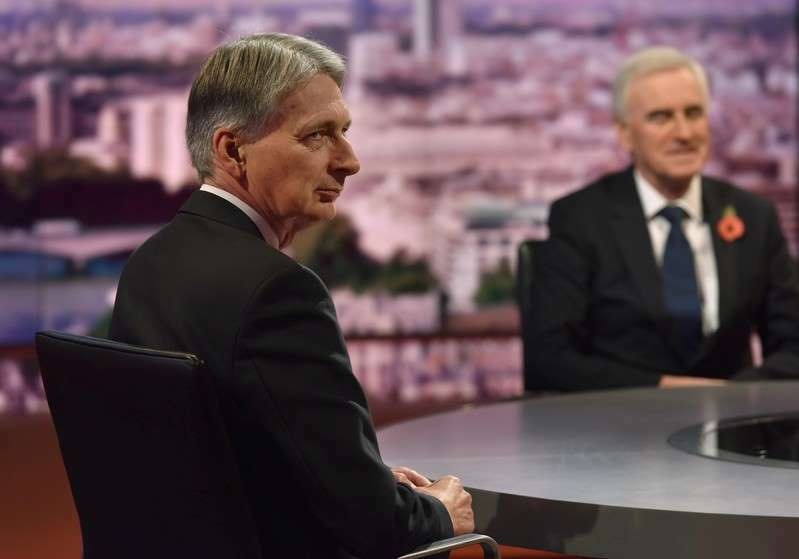 "If we don't get a deal ... we would need to take a different approach to the future of Britain's economy," Hammond told Sky News television on Sunday. "We would need to look at a different strategy and frankly we'd need to have a new budget that set out a different strategy for the future." Prime Minister Theresa May has so far failed to rally the Conservatives behind her Brexit strategy, raising concerns that Britain could leave the EU in March without a transition deal. Hammond could soften an immediate shock to the economy by spending some of the reserves he has built up within the limits of his fiscal rules. But a no-deal Brexit would probably cut Britain's annual growth rate to just 0.3 percent next year and in 2020 and push up borrowing, the National Institute of Economic and Social Research, a think tank, said last week. Britain's economy has slowed since the 2016 Brexit referendum but not as much as many economists feared, allowing Hammond to announce on Monday a further improvement in the budget deficit. Still, Britain's debt levels remain high, limiting how much Hammond can relax his spending squeeze. He said on Sunday that the biggest increase in spending in his budget had already been announced when May said four months ago that more money would go to the health service. He is set to announce other measures including more spending on roads, a tax cut for small retailers hammered by online competition and more spending on broadband. Hammond hinted on Sunday that he would soften the impact of changes to the welfare system and said he wanted a timetable for progress on getting giant tech firms to pay more tax. For now, however, he is expected to shy away from talking about a broader push for higher taxes that fiscal experts say Britain will need in order to meet the costs of an aging population. Last year, Hammond was forced into a U-turn on his plan to raise more tax from self-employed people after an uproar within the Conservative Party, which has since have lost its majority in parliament.